Rosy Outlook: My Favorite Coat + Fashion Frenzy Link-Up! 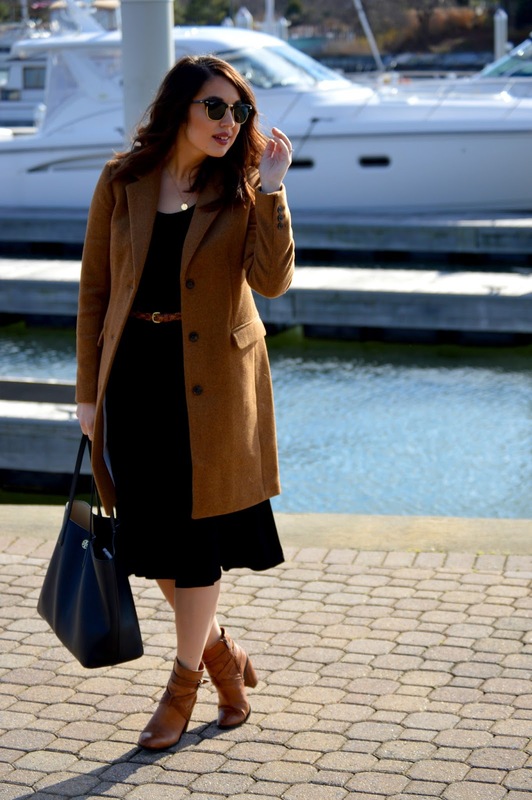 My Favorite Coat + Fashion Frenzy Link-Up! Happy Wednesday darlings! These pictures are so special because they were taken at the marina our wedding venue sits on! One thing I love so much about our venue is that on one side is this GORGEOUS marina and on the other side it overlooks the beautiful bay and the Bay Bridge. It's just view goals pretty much! All the key items I'm wearing (coat, dress and booties) are currently marked down for a GREAT price! I think y'all need this coat AND this dress in your life. If you're looking for the perfect neutral coat for winter, this is my favorite that I've ever owned! It fits SO well, it has a GORGEOUS light blue pinstripe lining on the inside and it's such a classic silhouette. I love all J. Crew coats but I think this one is the most timeless. Also, if you're like me and you love wearing dresses into fall and winter, this black midi dress is a closet staple. It's an awesome length and it actually has a gorgeous criss-cross detail on the back that just adds a little something! It's also a great price-point. This coat is to die for and I love it paired with the black midi dress! So cute! This is such a cute coat. I love how you have paired the whole outfit. The marina looks gorgeous and it's going to be a fabulous backdrop for your wedding! This is such a great coat, I was going back and forth between this one and the red with the faux fur hood. Love that black midi dress, too! Love this! Beautiful coat and booties! Such a great coat! Love the color. I LOVE this coat! The color and style are so classic and versatile, definitely a closet staple! I also love the dress and how it looks paired with the cognac pieces, one of my favorite color communions and you wear it so well! I also love the lipstick shade you're wearing, too! Thanks so much for sharing, beauty, and I hope you're having a great week so far! I love the color on that coat on you!! and those ankle booties are to die for!! great photo location! you look so stunning in that coat! great look! This location is gorgeous! Such a great venue for your wedding. This is such a pretty outfit, Kelly! Such a perfect place for a wedding! It's so awesome that you'll have a view of the water. Loving this look for winter as well - a camel coat really brings any look together - it's likw the no fail coat of winter haha! You look gorgeous lady! Love this classic look! 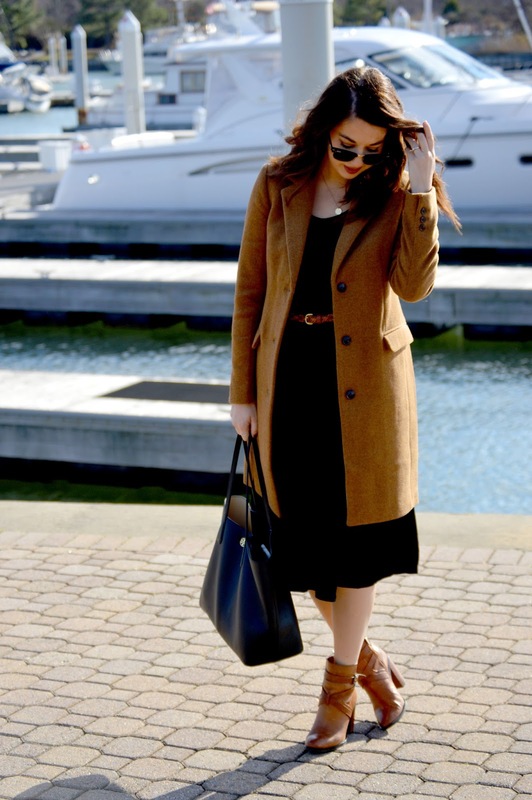 Loving this camel coat, lady- what a great winter piece! Love love that coat!! It's so perfect for fall too. Kinda feel like I now need it in my closet too!